Old Loggers Path is an orange-blazed long-distance backpacking trail that follows former railroad grades, logging roads, bark trails, and other remnants of old industrial transportation, hence the name. The trail is a circuit through remote areas in northeastern Lycoming County. Highlights of the trail are the many revealing cuts on the railroad grades; Rock Run, one of the prettiest streams in Pennsylvania; and vistas over McIntyre Wild Area, Pleasant Stream, and the Loyalsock Trail region. This area and many others like it have been described in a series of historical books on logging railroads. This region, including Masten, is included in Ghost Lumber Towns of Central Pennsylvania (1970), by Thomas Taber. Old Loggers Path is located entirely on state forest land that formerly belonged to the Central Pennsylvania Lumber Company. The trail takes advantage of the engineering expertise of the early logging railroaders by following the moderate grades up and down the rugged landscape. 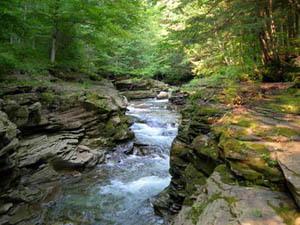 For a detailed description of a backpacking trip on the entire Old Loggers Path, see 50 Hikes in Central Pennsylvania (2001), by Tom Thwaites. To reach the starting point, go 2.7 miles southwest of Ellenton on LR 41110 or 9.4 miles up Pleasant Stream Road from PA 14 at Marsh Hill. Look for parking near the stop sign in Masten, a ghost lumber town. The starting point is a short distance down Pleasant Stream Road. The route from Ellenton is the only access in the winter, as all other roads are usually blocked by snow. Keystone Trails Association sponsors a patch for this trail. The patch and a guide published in the PAHikes Trail Guide Series is available at KTA's Bookstore.